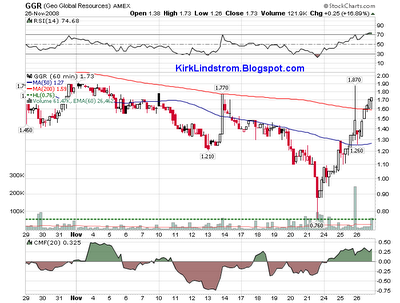 GeoGlobal's stock (GGR charts) more than doubled in the past week. Now we know one reason why. GeoGlobal's partner, the Gujarat State Petroleum Corporation (GSPC), struck oil in its onshore Ankleshwar well number 21 at a depth of 2,200 meters. Several sources say the well is yielding 200 barrels a day. Gujarat State Petroleum Corporation (GSPC) has struck oil in one of its onshore wells in Ankleshwar, said sources close to the development. "Oil was struck at Ankleshwar Well No. 21 at a depth of 2,200 metres and it has begun yielding 200 barrels a day. GSPC has drilled five wells from May to August this year. “The testing in the well, where oil has been found, is yet to be completed. Meanwhile, testing in other wells is also on,” sources added. " As at November 17, 2008, five exploratory wells have been or are being drilled on this block. The Ank-1 and Ank-8 wells were drilled to total depths of approximately 2,600 and 2,100 meters respectively. Both wells have been tested and are currently suspended awaiting further evaluation. The Ank-10 and Ank-21 well have been drilled to a total depth of approximately 1,400 and 2,200 meters, respectively. The Ank-10 has been tested and is awaiting further evaluation, while the Ank-21 is currently being tested. Disclaimer #1: I am on "house money" with GGR. I purchased GGR for my newsletter explore portfolio between $0.94 and 2.25 in 2004 and I have shares purchased as low as 12¢ in my personal portfolio. I took a TON of profits when the stock was high, including twice in the $13s in late 2005, so I have huge profits in this already which may allow me to trade this more aggressively. Disclaimer #2: I added 2,000 shares to my newsletter "explore" portfolio last week at $1.30 when it reached my "Auto Buy" target, a limit order set ahead of time at our brokers. As luck would have it, I got 1,000 shares put into my ROTH at $1.24 via my limit order as someone was in a huge hurry to sell into the panic last week where my net was out to catch some shares. Jim Rogers was just on CNBC talking about the markets. Rogers said he covered his shorts last month. In the past, Rogers said was short the financials. Jim said he hopes president elect Barack Obama will not raise the tax on capital gains at a time when capital is scarce. He postulated that only an idiot would do such a thing at a time like this and Senator Obama may have said this only to get elected. When asked where to invest, Rogers said China. He admitted he did not take any profits in China before the crash but thinks investing in China now is like investing in the US 100 years ago. He said he has been investing in China since the 1990s. His belief is there will be major ups and downs in China but that is where the huge growth will come from so he is there for the long term. They pressed him to recommend one US stock to buy. Jim said he was buying airlines but paused and said they were international, not US based. Pressed again he suggested his commodity fund then said he owns US utilities and will probably buy some more of those. If I missed anything Rogers said, then please post it in our comments section. Does anyone have any suggestion as to where I could go to talk to someone. I'm not feeling well about my losses these days. This was money I had planned to use for kid's college. I am also having really depressing thoughts. Is there any support groups for this sort of thing. #1. It is only money. Your family and health are the most important things. Put them first. #2 You can always make more money, spend less, downsize your standard of living, or whatever it takes. #3 You are not alone. I don't know anyone who feels good about what happened. 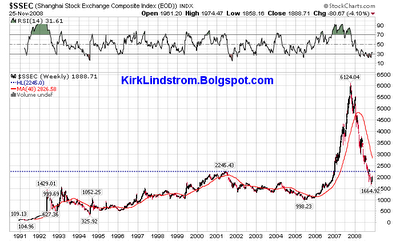 Most of the bears I know were gold bugs so they are down over 30% in a very short time also. #4 Talk to your family doctor. Death in the family or major losses like we've seen might be a good time for a mild anti depressant while you seek help. I know people who took meds for far smaller losses so this is nothing to be ashamed of. #5 EXERCISE! I feel great now after a hard workout at my club. I try to do 30 minutes minimum each day on my treadmill if I don't ride my bike for an hour, windsurf or go to my health club. Exercise is the best drug therapy there is. Make sure you talk to your doctor first if you are not in shape! #6 Contact your county mental health hotline. Click the link and put your zip code in the search box and it should give you numbers to call. #7 If you are a person of faith, your local lama, priest, rabbi, minister,cleric, etc. is there for you as well as members of the communities they serve. #8 Find something to laugh about, even if it is our own stupidity to believe the markets and economy were too strong to fall over 50%. Laughter is the best medicine. If you need some help, read Buy a Toaster and Get a Free Bank!" Finally, let us know how you are doing. People care, even if you are just a stranger, We are all passengers on this planet together as it travels through space and time. Buy a Toaster and Get a Free Bank! 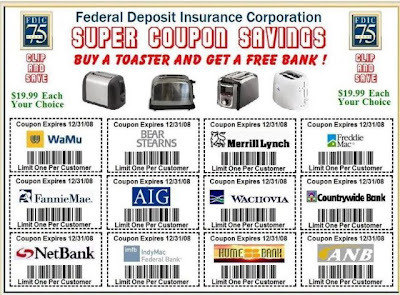 The FDIC has some super duper coupons. You might want to wait a week and perhaps the FDIC will give you a toaster to take a bank! I got humor this in the mail from my long time reader "Tony from Glendale." Everyone who has money in the stock market was rooting for this to be true. Beautiful and intelligent CNBC reporter Erin Burnett (Erin Burnett Fan Club) just reported there were over two million Google searches for information on Art Hogan's Bottom Call. Sadly, yesterday we went much lower. Below is a chart from "Chart of the Day" showing how this "correction" stacks up for all corrections between 1900 and today. For some perspective on the current correction, today's chart illustrates all major stock market corrections (15% loss or greater) of the last 108 years. Each dot represents a major correction as measured by the Dow. For example, the bear market that began in 1973 lasted 481 trading days and ended after the Dow declined 45%. As it stands right now, the current stock market correction (October 2007 peak to most recent low which occurred today) would measure slightly below average in duration but above average in magnitude. In fact, of the 26 major stock market correction since 1900, the current stock market correction currently ranks as the fourth largest in magnitude (only the corrections beginning in 1906, 1929, and 1937 were greater) and is the most severe stock market correction of the post-World War II era. Currently the VIX "fear indicator" is pulling off record high levels going back to 1990. 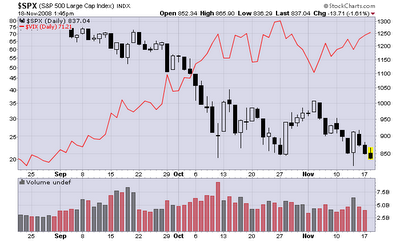 Currently the market is testing the October 10th and 27th lows. If it can do it with a lower peak VIX and lower volume, then this is a good sign for a rally, if not a cyclical bull market. 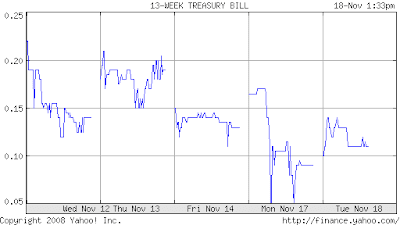 At the same time, investors are so scared of risk they bid the 13-week treasury bill down to 0.05% yesterday. Historically, when investors act irrationally, doing the opposite provides large rewards for those who have the ability to look to the long term. Just as investors poured into risky internet stocks with no earnings to make the March 2000 top, dumping quality growth companies that pay dividends for the safety of 0.05% Treasury bills is not rational in the long-term. "Buy when there is blood in the streets"
Nathan Rothschild, the British member of the Rothschild banking family in the early 19th Century commenting on the best time to buy. He is reputed to have made a fortune from the Battle of Waterloo stock market panic. His full quote is believed to be "Buy when there is blood in the streets, even if the blood is your own." Warren Buffett is a buyer. See Warren Buffett Buy Signal. Short-term, the market can do anything but for the long-term, I agree with people like Warren Buffett. When you get the VIX and other fear indicators showing investors are acting irrationally out of fear, rewards are there for those who can look to the long term. To learn what I have been buying with my own money and recommending to my newsletter subscribers, Subscribe TODAY and get the November 2008 issue for FREE! Definition: The VIX is the Chicago Board Options Exchange (CBOE) Volatility Index. The VIX shows the market's expectation of 30-day volatility. It is calculated from both calls and puts that are near the money. The VIX is a popular measure of market risk thus making it another great contrarian “fear indicator” useful for short-term market timing. Market Timing Disclaimer: No sentiment indicator, or any indicator for that matter, is 100% reliable. I look at sentiment as head winds and tail winds. When sentiment is terrible, then it acts like a tail wind for your returns where you could see further declines, but long term, it is best to be buying when most others are selling. Likewise, if we see sentiment get too bullish, then I would consider lowering my portfolio asset allocation. It seldom pays to be buying stocks when EVERYONE is talking about stocks and how much money they are making at cocktail parties. 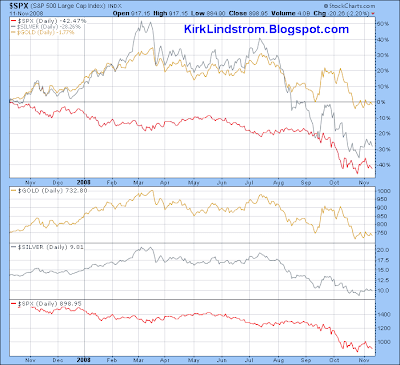 In addition, I am not market timing but for a small portion of my explore portfolio. I use market-timing indicators to tell me it is a good time to buy so I can add to positions when the market is down and thus help me overcome my fear to rebalance back to my target asset allocation. Likewise, when the market-timing indicators are saying to sell, they usually come when the markets are high where I want to be taking profits. The market timing indicators at market highs help me get over my greed and take profits. Now and then, I may make an asset allocation adjustment based on the Fed Model saying the market is over or under valued. Some call that market timing, but I do not. Also, I have stayed pretty close to 70:30 equities-fixed for many years despite the Fed model which has its own set of flaws. Subscribe TODAY and get the November 2008 issue for FREE! Amanita Forecasting has announced the Bradley Turn Dates for 2009 and the remainder of 2008. Amanita Forecasting uses the "Bradley Siderograph" and astrology to predict major market turns. It does not predict the direction. Click => full list of Bradley Turn dates and a full sized chart. People like to follow what is working. If Arch Crawford was the top, big name market timer this year and he predicts a major rally into mid 2009, then this can be a self fulfilling prophecy as followers can move the market. For example, Crawford was one the 10 worst-performing letters of 2006. 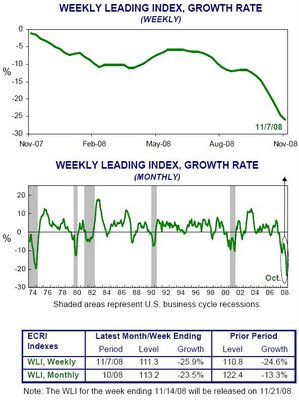 Today ECRI said its WLI rose to 111.3 for the period ending November 7, 2008. Last week WLI was 110.8 . The WLI growth rate fell to -25.9%, down from -24.6% last week. Commenting on the data, Lakshman Achuthan, managing director at ECRI said "With WLI growth continuing to plumb new lows, not only is no economic recovery on the horizon, but the economy is falling off a cliff at its fastest pace in at least six decades." Jim Rogers says he expects the actions by governments around the globe to save their economies will cause inflation and crash the US dollar. As such, Rogers is short long-term US Treasuries (US Treasury Rates at a Glance) and long silver. Rogers has a good long-term record. For one, he has been short the banking stocks this past year as they have crashed and burned. Rogers was also a co-founder with George Soros of the Quantum Fund. " During Roger's ten years with the fund, the portfolio gained more than 4,000%, while the S&P rose less than 50%. "The fact that the dollar is gaining rapidly is only temporary"
"Within a year you'll have to get rid of the dollar"
Rogers also said US government bonds are extremely overvalued. "They are "the world's last bubble." Rogers explained that government economic rescue plans will force governments to issue more debt, print money and flood the markets with liquidity which will flare up inflation after the crisis is over and create worse problems. Rogers says "zombie banks" kept alive by Paulson and Bernanke should be allowed to fail. He compared it to Japan which refused to let banks fail in the 1990s. "It's 18 years later and their stock market is 75% or 80% below what it was 18 years ago"
"I know we are going to get aggressive rate cuts everywhere, that's why I'm long short-term government bonds in the US, but shorting long-term government bonds because it's not going to help, it's going to add to inflation." Rogers expects investors to return to precious metals as a hedge against inflation. Rogers think gold may fall as central banks and the International Monetary Fund (IMF) sell the metal to raise cash. 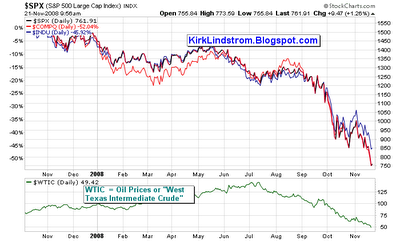 Another way to hedge against high inflation is to buy TIPS or Treasury Inflation Protected Securities. I-Bonds and TIPS for inflation protection. By having three fixed income buckets, I can rebalance after one of the buckets has a period of out performance. For more on that strategy, see " Using Asset Allocation to make money in a Flat Market." 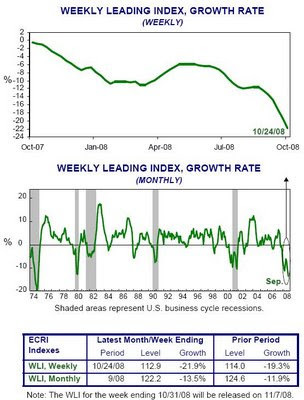 Today ECRI said its WLI fell to 110.9 for the period ending October 31, 2008. Last week WLI was 112.9 . The WLI growth rate fell to -24.6%, down from -21.9% last week. "We are now in a severe recession." 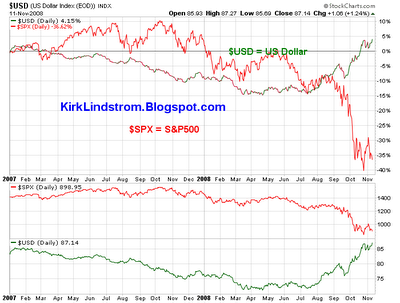 "The leading indicators are showing no light at the end of this tunnel. In the last week of October they registered their worst readings in their six decades of history. It tells you the economy's not just down, it's plunging. There is no end in sight to this recession." Before the Federal Reserve lowered the Fed Funds Rate to 1.00%, I bought a 4.30%, 1-Year CD at Wachovia Bank. Banks have to pay the US government 5.0% to get money from Treasury Secretary Hank Paulson's "troubled asset relief program" or TARP for short. Rather than pay the government 5.0% for TARP money, they are better off bringing in new customers with high CD rates despite the low Fed Funds and US Treasury rates. Funds are FDIC insured to the maximum amount allowed by law. You can also get a 4.00% 1-Year CD at Wachovia Bank with no checking account restriction with only a $1,000 minimum deposit. Bankrate.com lists the best 1-year CDs for today, but it does not include Wachovia Bank or Comerica Bank so it pays to look around. Congress has temporarily increased FDIC deposit insurance from $100,000 to $250,000 per depositor through December 31, 2009. Changes have also been made to other account types. 13-week, 5, 10 and 20-year charts. Newly issued Series I Savings Bonds (aka iBonds and I-Bonds for "Inflation Protected Bonds") will pay 5.64% and Series EE Bonds will pay 1.30%. I-Bonds are a 100% safe way to defer taxes while getting inflation adjusted return for up to 30 years. These rates for new bonds are effective from November 2007 through April 30, 2009. Earnings rates for I bonds and fixed rates for EE bonds are set each November 1 and May 1. Interest accrues monthly and compounds semiannually. Both have a one year minimuBonds held less than five years are subject to a three-month interest penalty. Both series have an interest-bearing life of 30 years; the EE bond fixed rate applies to a bond's 20-year original maturity. The earnings rate for I-Bonds is a combination of a fixed rate, which applies for the life of the bond, and the semiannual inflation rate. The 5.64% earnings rate for I bonds bought from November 2008 through April 30, 2009 will apply for their first six months after issue. The earnings rate combines a 0.70% fixed rate of return with the an adjustment for the annualized rate of inflation as measured by the Consumer Price Index for all Urban Consumers (CPI-U). The fixed rate applies for the 30-year life of I bonds purchased during this six-month period.